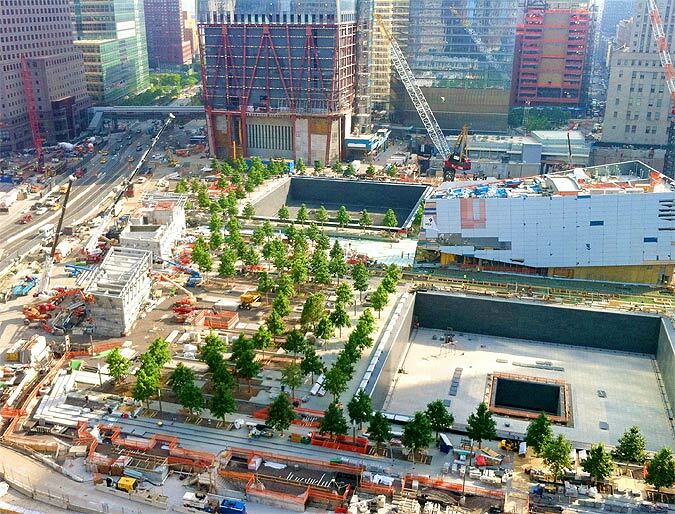 A decade after the 9/11 attacks, the public will soon be able to visit the site, much of which has been fully transformed into the 9/11 Memorial Plaza. While many were dispirited by the years of revisions to and deviations from the Libeskind master plan (which itself had many detractors), AN‘s recent visit to the plaza, crowded with workers laboring toward the anniversary opening, revealed a vast, contemplative space that we predict will function well as both a memorial and a public space. Next week AN will take a look at the design and offer a preview of the what the public can expect from the space, but, first, a look at how the highly engineered plaza works. With transit tunnels, mechanical systems, and much of the memorial museum located below the surface, the plaza itself could only be approximately six feet thick. 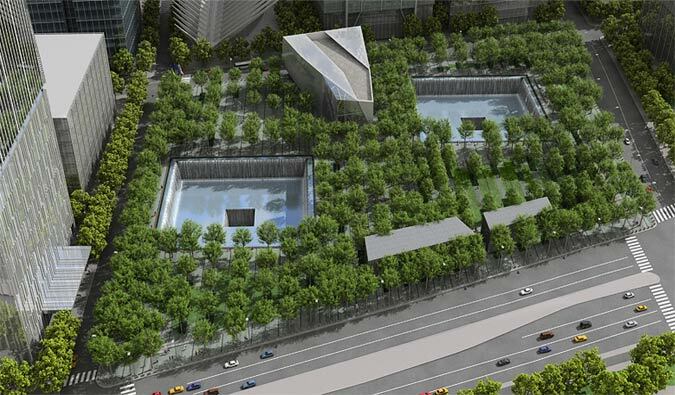 Unlike the original World Trade Center Plaza, which many found to be barren and scorching or windswept, the Memorial Plaza is conceived of as an abstracted forest of Swamp White Oaks surrounding two monumental pools outlining the footprints of the original towers. 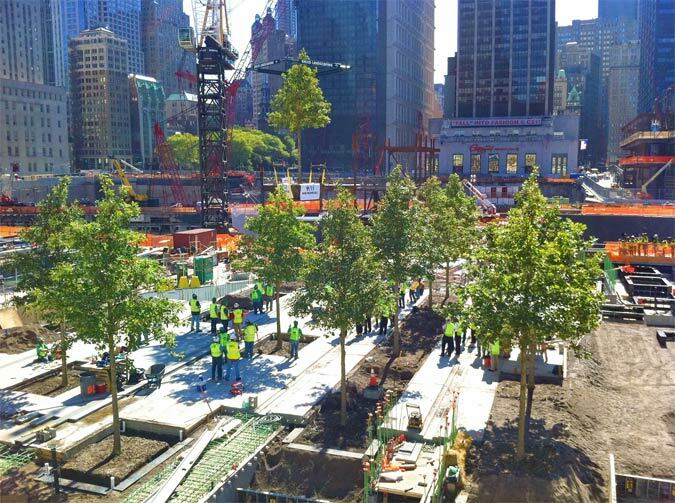 Designed by Michael Arad and Peter Walker Partners, with Aedas, the plaza will include approximately 400 trees, 215 of which will be in place for the opening. About one third of the plaza has yet to be constructed, while the Santiago Calatrava designed PATH station is being completed. Plaza plantings are arranged in bands, alternating between bands of pavers and bands of trees, grass, and ground cover. This creates both a unifying visual language for the large plaza and a highly rational system for organizing the mechanical and irrigation systems on the site. Between the planting bands, accessible utility corridors house electrical and security equipment. Drainage troughs divide the planting bands from the utility corridors. The whole plaza acts as a vast stormwater collection tray. The plaza is very carefully graded to channel stormwater into the drainage troughs. 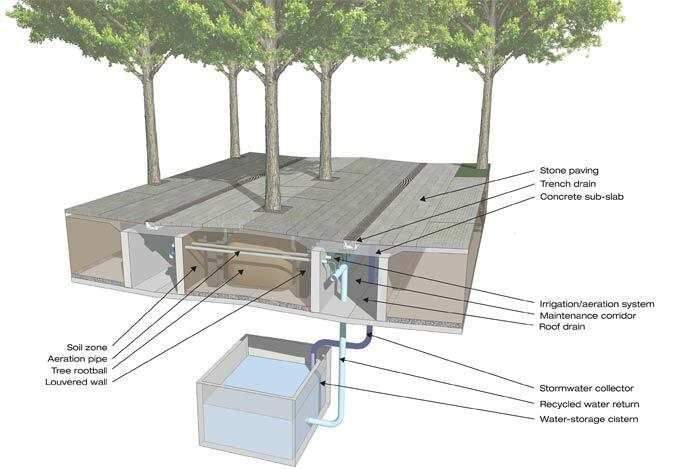 Rainwater is collected in cisterns below and recirculated in the plaza’s drip irrigation system as well as funnelled into the memorial fountain. 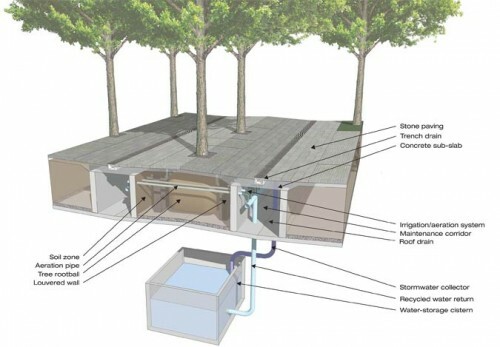 The trees grow in a lightweight mixture of sand, shale, and worm casings. 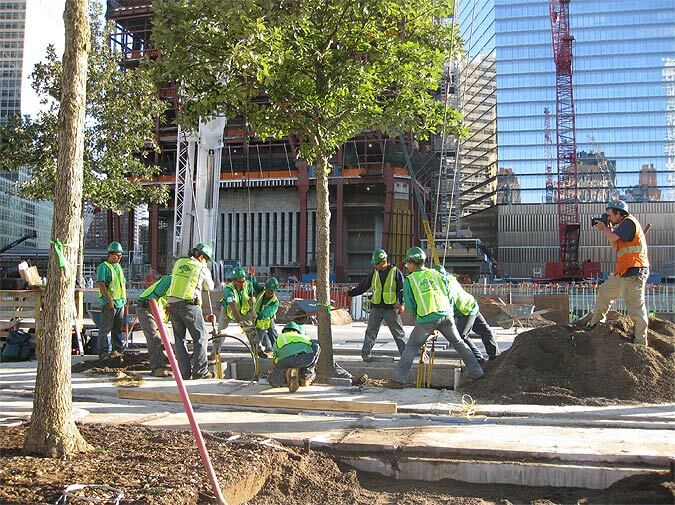 Growing and installing the plaza’s oaks has been a long process. 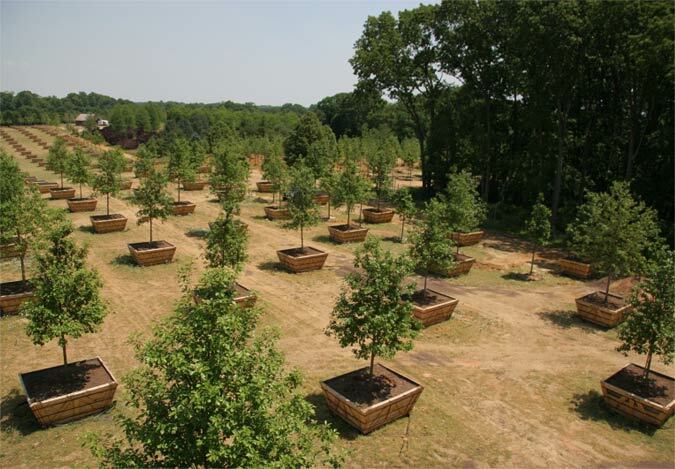 Given the pace of slow construction, the trees, which have been cultivated at a nursery in New Jersey, are much larger now, most standing around 25 feet tall. Trees were hauled onto the site with cranes and then placed in the planting beds with a specially designed lift. Tree roots will spread laterally, filling in the planting bands, and designers believe they will eventually reach 60 to 80 feet in height. The roots are anchored with bracing under the stone pavers. While the PATH station is being completed, the remaining unfinished plaza is still an uncovered construction site, inaccessible to the public. According to Matthew Donham, a partner at Peter Walker, the construction of that portion of the plaza will be even thinner in depth. Aside from an expansion joint, there will be no visible difference between the two sides.